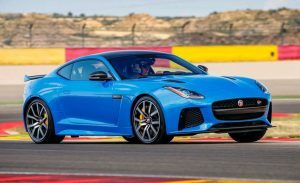 Home Auto 2018 Jaguar F-Type SVR Coupe– 575 Horsepower –Magnificent! The Jaguar F-Type arrives in three models: the base F‑TYPE Coupe priced from: $69,500 with a 296 hp Turbocharged 4-cylinder, or a 340 hp or 380 hp Supercharged V6 engine. The F‑TYPE R Coupe is priced at $114, 500 and offers a 550 hp, 5.0L Supercharged V8 engine, and All Wheel Drive. Finally there is the top of the line SVR high performance coupe as tested with a base MSRP from: $140,500. Key upgrades on the SVR include the uprated 575 hp, 5.0L Supercharged V8 engine, All Wheel Drive system, unique 20″ Forged alloy wheels, Carbon Fibre rear wing, front and rear spoilers, carbon fibre hood vents and uprated yellow brake calipers to set off the exterior. Interior upgrades include the SVR performance seats in a wonderful Lozenge pattern quilted leather with contrasting stitching and piping, heated SVR branded leather steering wheel with aluminum gearshift paddles and much more. The cabin is draped in plenty of leather and Alcantara trim and the F-Type’s switchgear is exquisitely crafted. It’s an interior to just die for, featuring meticulously fitted high quality components. Jaguar claims a 0–100km/h time of around three and a half seconds, and if anything, the SVR feels even quicker. Superb supercar thrills all the time!